One must-have I always have in my luggage when travelling abroad is a pocket projector. It sure beats the hotel TV’s being able to stream YouTube and Netflix on a big projection in my hotel room. The PIQO Indiegogo project takes the latest and greatest projection technology and puts it in the smallest form factor imaginable. What is the PIQO Projector? 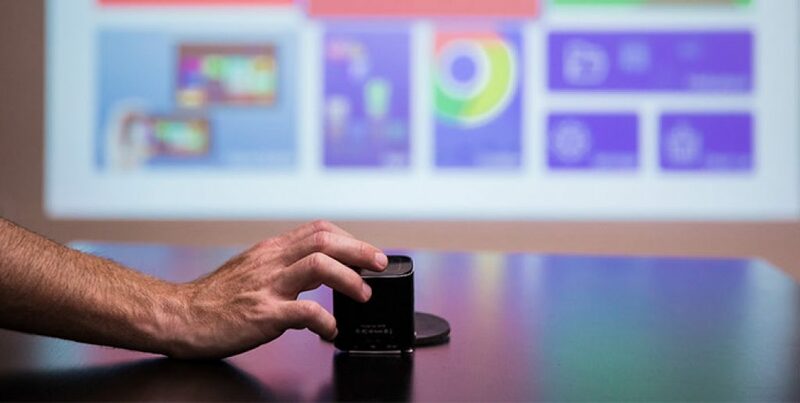 The PICQ is a very portable 1080p projector that you can connect to your smartphone or laptop (via Wifi or Bluetooth) to project a bright 200 lumen, 240″ picture on your wall, ceiling or projector screen. With Android onboard you can stream Netflix or YouTube or any other app directly from the PIQO. If you don’t have an active internet connection the PIQO has 16GB of space for offline content storage, which is ideal if you want to watch some downloaded Netflix content. The PIQO is meant to be taken everywhere. That’s why it has automatic gravity detection to correct the angle to the right one, whichever surface it’s on. Also, there’s a supposedly high quality speaker onboard, so no need to drag along that additional bluetooth speaker for proper sound. Best thing seems to be battery life. With 5 hours of playtime on a single charge the PIQO wipes out competing projector’s in its price range. The fast-charging ability gets you an hour of playtime on a 15-minute charge. Who is the PIQO Projector for? Where can I get the PIQO Projector? The PIQO is running an already successfully funded campaign on Indiegogo right now. After the campaign closes the PIQO projector is supposed to ship to backers right away. For a little more than three hundred bucks you’re able to get one delivered as an early bird backer.